In more controlled circumstances than the hammer case, a hydraulic press is used to crack a 10 cm cube of ice. Experiments like this are performed by Erland Schulson’s group at Dartmouth College. A good paper to read is Illescu and Schulson (2004). The cube is compressed in two directions mimicking the forces present in the flat plane of the sea ice cover. The forces in the two directions are not equal and have a ratio R, called the confinement ratio. 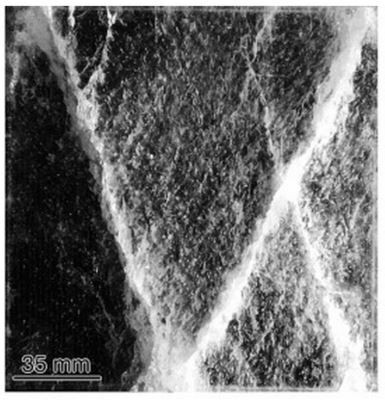 Due to the material properties of ice, for certain values of R, a pair of cracks form as shown in Figure 1 (typically R<0.3). The arrangement of the two cracks can be compared to satellite images of sea ice (see this video) where two sets of pairs of cracks combine to give diamond shaped ice floes. For higher R, a single crack forms across the plane. For large-scale sea ice this may correspond to pressure ridging, the break-up of sea ice that piles about itself into long (many km) ridges several metres high, like a mini Himalayan range crushed between the Indian and Asian plates. 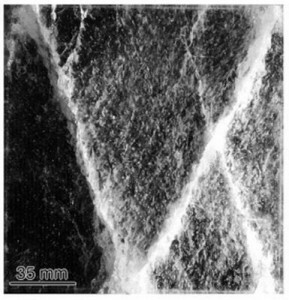 So there is a link between small scale cracks in a piece of ice and the patterns of cracks over 100s of km – why is this helpful? When considering sea ice as part of the global climate, we need to know how it moves when pushed around by the wind and ocean. Does it drift freely, bounce off neighbouring floes, or crack and form pressure ridges? Does Arctic sea ice drift into the north Atlantic where it is warm, or collect above Greenland where it is cold? Well, if we use the knowledge gained from our small ice sample we can track the likely direction of the diamond shaped floes. We use the applied forcing field (from the wind and ocean) to calculate the forces upon the sea ice and thus calculate R, the confinement ratio. If R is within a suitable range, diamonds form orientated in a particular direction. Now if we know that there are diamond-shaped floes in the ice cover, we can make predictions about how these floes slide past each other and resist the external forcing. The theory behind this method of prediction has been developed by my colleagues Danny Feltham, Alex Wilchinsky and Michel Tsamados and can be read about here and here. Recording the directional memory of a deforming medium in this style is called anisotropy, a word that makes us over-ambitious fluid dynamicists giddy with excitement. So what is the next step in this research? We know about cracks, we know about diamonds, and we can use them to predict the drift of sea ice. But this is sea ice, a constantly changing medium, and of course, the cracks can refreeze. Also, how fast do the cracks form? Thankfully there are scientists who venture to the frozen seas with chain saws and investigate cracks in sea ice. They watch how quickly the cracks refreeze and put jacks into them to split entire floes in half. Cracks also important for the formation of ice. When cracks open in the cold winter, the open ocean is exposed to bitterly cold atmosphere, causing the rapid production of ice in the water below. We have a recent study (very soon to be published) showing that this method may be responsible for a third of ice production in the central Arctic. My work is to explore these questions adding to our knowledge of sea ice cracks. Wilchinsky, Alexander V., and Daniel L. Feltham, 2006. Modelling the Rheology of Sea Ice as a Collection of Diamond-Shaped Floes. Journal of Non-Newtonian Fluid Mechanics 138, no. 1 (September 2006): 22–32. This entry was posted in Cryosphere, Polar and tagged Arctic sea ice. Bookmark the permalink.